Keeping within their tradition, Walrus have come up with a fantastic and unique piece of technology. 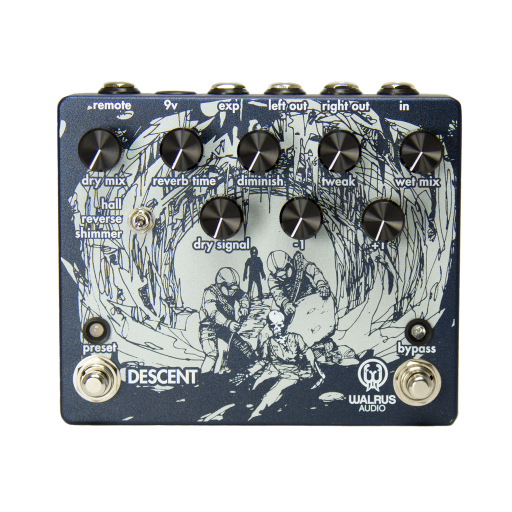 Boasting more than its fair share of sonic capabilities, the Descent is way beyond decent. There is much more to this pedal than your standard reverb box. It is a perfect way to give you some slightly wacky but absolutely beautiful colors in your sound. This interface takes a lot of options and settings and makes them easy to understand. As with other Walrus pedals, the separate wet and dry knobs are a huge benefit. This reverb pedal can do a lot. It can achieve standard simple reverbs, but can also send you out into the ambient stratosphere. With its octave up and down additions and three reverb modes, this is uniquely versatile. Each of this pedal’s many effects sounds wonderful. Your tone will not be compromised even with all of the wacky octave options dialed in. On sax, the lower octave reverb voice sounds very nice. The upper octave can sometimes be somewhat shrill. Great live pedal! It is easily manipulable, applicable in many contexts, and has three presets.